SAN JUAN CAPISTRANO, Calif. (BRAIN) — Outdoor Retailer will be looking to sell space to bike industry brands at its show in Denver this November. Outdoor Retailer is owned by Emerald Expositions, the owner of Interbike, which announced in December that it was canceling its 2019 show. 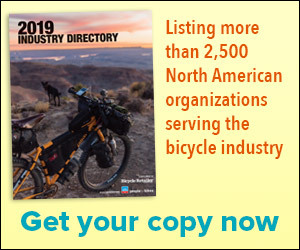 SANTA FE, N.M. (BRAIN) — In the October issue of Bicycle Retailer & Industry News, we made an assertion that Interbike had offered free booth space to selected key brands. When I read that sentence I was struck by the fact that no one at Interbike had responded—one way or another—to that assertion. The show says its OutDoor Demo, educational offerings and other events were well attended and got top marks from attendees. SAN JUAN CAPISTRANO, Calif. (BRAIN) — Interbike show organizers said overall feedback was mostly positive from exhibitors and attendees at last month's expo in Reno, Nevada.